I am absolutely loving this fall ensemble worn by Kelley Paul on November 2nd, the night her husband, Rand Paul, won the Kentucky U.S. Senate seat. Red and black are my favorite colors. This jacket is great for women with small, narrow frames, like that of Mrs. Paul. Buttoning only the pins at the natural waistline, as Kelley did, helps create an hourglass figure. The only women who need to steer alway from this look are those with more apple silhouettes, as this double-buttoning jacket shape can add to the width of a woman’s frame. I can not get over how gorgeous this rich, red color looks on Kelley. Normally, blondes look better in blue, but I am happy she opted to wear republic red last night. 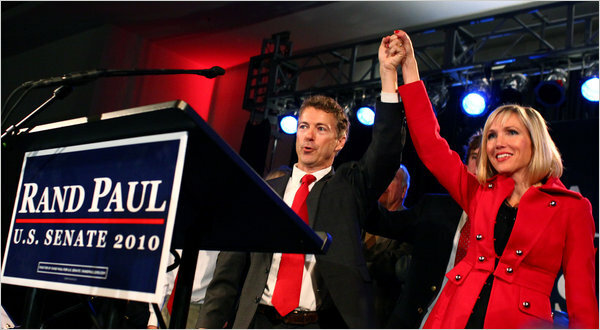 Hopefully, now that her husband is a Kentucky senator, we will see more of Kelley Paul and her avant-garde fashions.